The Queen returns to the Big Screen at The Paramount Theater. Cover image by Johann Persson. 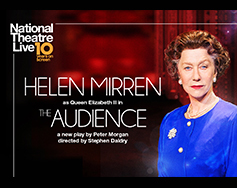 Helen Mirren as "Queen Elizabeth II"
Haydn Gwyn as "Margaret Thatcher"
Richard McCabe as "Harold Wilson"
Robert Hardy as "Winston Churchill"